The terms and conditions set forth below apply to each Broker Framework Agreement executed between Vela Trading Systems LLC (“Vela”) and a “Broker”, as that term is defined in the respective Broker Framework. The term “Agreement” as used herein refers to each separate Broker Framework Agreement so executed by Vela and a Broker together with the terms and conditions set forth below. 1. Purpose, Term. This Agreement is intended to set forth the roles Broker and Vela with respect to Client’s trading through Broker on Vela’s PaaS DMA Platform (the “Platform”), including Broker’s risk management controls over Client’s use of the Platform with respect to trading through Broker. This Agreement is not a part of Client’s license with Vela nor Client’s account agreements with Broker, and neither Vela nor Broker shall be deemed a third-party beneficiary of, nor have any obligations to the other party hereto under the other’s agreement with Client, except to the extent expressly set forth in any such other agreement. The term of each Broker Framework Agreement shall be for the period during which a Client has the ability to enter live trades through the Platform. 2. The Platform. The Platform consists of the installation, management, maintenance and monitoring of the FrontRunner suite of products covering market data, order execution, pre-trade risk enforcement, middle office integration and command and control screens/interfaces. 3. General Roles and Responsibilities. Vela is responsible for the delivery, availability and performance of the Platform to Client. During any period when Vela has been made aware that Client has access to the live order entry function of the Platform at any exchange through Broker, Vela shall permit Broker to access the Platform’s tools and interface points so that Broker can have control of the risk constraints for Client as determined and set by Broker in its sole discretion. Vela shall have no responsibility for setting or enforcing any risk controls over Client, including the adjustment of any user configurations. Vela shall not be responsible for, and shall not under any circumstances, submit, modify, change or cancel any order entered by Client or Broker. As with respect to Broker and Vela, Broker shall be responsible for all order entry/modification/cancellation functions. From time to time Broker or Client may request, and Vela may agree to provide assistance to Broker or Client with assistance with order entry/modification/cancellation, positions, etc. Broker acknowledges that in such cases any information provided by Vela during this support will be based solely on the data/view available on the Platform at that exact moment in time and it is Broker and Client’s responsibility to verify such information with the applicable exchange. Vela shall not be responsible for any order entry/modification/cancellation made during or after Vela provides such support. Broker shall pay any charges owed to Vela under the Broker Framework Agreement annually in advance. 4.1. Platform Broker Functionality - Training and Documentation. Vela will, if requested, provide up to eight hours of training and operational documentation on the use of the Platform interfaces and tools detailed below at no charge to Broker or Client. Broker shall be entitled to request additional training from Vela at Vela’s standard hourly rate. 4.2. Risk Enforcement. Vela shall provide the mechanisms for Broker to set, monitor and enforce pre-trade risk limits on the FrontRisk. Broker has sole and exclusive access to the top (or global) limits on the FrontRisk. 4.3. Kill Functionality and Trade Flow Management. Broker will have the ability to cancel some or all of Client’s orders through the FrontTrade/FrontRisk using the standard Block and Blacklist features in FrontRisk. Vela shall not cancel orders on behalf of the Client or Broker. An escalation procedure is in place to authorize the blocking of trade flow messages or to shut down the platform, this can be initiated either by the Broker or by the Client. In an emergency situation Broker should co-ordinate with the applicable exchange directly to effectuate order cancellations. Vela is not responsible for monitoring Trade Flow. Vela may, if requested, access the FrontTrade/FrontRisk to support the Broker and/or Client. However, any such support will be based solely on the data/view available on the Platform at that exact moment in time and it is Broker and Client’s responsibility to verify such information with the applicable exchange, and Vela shall not enter, modify or cancel any orders as part of providing such support. 4.4. Drop Copy. Broker shall also be responsible for the integration of the standard FIX Drop Copy into the Broker’s Trade Flow management. 4.5. Connectivity. Broker shall be responsible for providing the VPN and/or cross connect to the FrontTrade/FrontRisk location. Broker acknowledges that latency or delivery for internet-based connectivity cannot be guaranteed to the same standard as dedicated connectivity. 4.6. User Access. Broker shall have access to the Platform tools used to set up and manage Client’s trading through the Platform. Broker shall be responsible for maintaining accurate access lists at all times. 4.7. Record Retention. The Platform’s FrontRisk feature shall retain appropriate Logs and Audit Files relating to trading activity of Client for 30 days after any such trades. It shall be Broker’s responsibility to request and collect and retain such data through Broker’s VPN or cross-connect access. 4.8. Testing Environment. Vela is responsible for conformance testing of the FrontRunner technology to each exchange with which it contracts. This testing shall be completed by Vela prior to the date on which Client is provided live trading access through the Platform to each such exchange. Broker and Client are responsible for Client’s trade follow conformance. Broker shall be responsible for enforcement of the appropriate conformance testing regime and for disabling Client’s access if such testing is not successfully completed. 5.1. Receiving and Disclosing Parties. To the extent a party receives or acquires Confidential Information directly or indirectly under this Agreement, it shall be referred to as the “Receiving Party”; to the extent a party discloses Confidential Information under this Agreement, it shall be referred to as the “Disclosing Party.” “Confidential Information” shall mean all tangible or intangible information and materials, in any form or medium now known or hereafter devised (and without regard to whether the information or materials are owned by the Disclosing Party or by a third party). 5.2. Duty of Care. Each party shall maintain in confidence all Confidential Information received, whether orally or in writing, from the other and shall not disclose or otherwise make available such Confidential Information to any third party without the prior written consent of the Disclosing Party; provided, however, that each party may disclose the other party’s Confidential Information to the Receiving Party’s officers, employees, consultants and legal advisors who need access to such Confidential Information in connection with the Receiving Party’s performance of its obligations under this Agreement, and the Receiving Party may disclose the financial terms of this Agreement to its legal and business advisors and to potential investors if such third parties agree to maintain the confidentiality of such Confidential Information. Each party shall use the Confidential Information only for the purposes of performing this Agreement. Each party shall use the same degree of care to protect the Disclosing Party’s Confidential Information as it uses to protect its own Confidential Information of like nature, but in no circumstances less than reasonable care. Each party shall ensure that any individual or entity receiving Confidential Information for or on behalf of such party under this Agreement shall be bound by terms at least as protective of the Disclosing Party’s Confidential Information as those contained in this Agreement. 5.3. Injunctive Relief and Survival. In the event of an actual or threatened breach of this Section 5, the parties agree that the non-breaching party may have no adequate remedy at law and shall be entitled to seek immediate injunctive and other equitable relief, without bond and without the necessity of showing actual money damages. The Receiving Party’s obligations of confidentiality shall survive this Agreement for a period of three years from the date of its expiration or termination, except in the case of trade secret information, in which event such obligation shall survive for as long as such information remains a trade secret. 6.1. Infringement Indemnity to Broker. Subject to the provisions of Section 6.3, Vela shall have the obligation to: (1) defend Broker from and against any claims, suits or proceedings brought against Broker by a third party based upon a claim that any Platform provided by Vela to Broker and its Client infringes upon any U.S. patent, copyright or trademark (each, a “Claim”) and (2) indemnify Broker against final judgments entered in any such Claim by a court of competent jurisdiction and against settlements authorized by Vela arising out of any such Claim. Vela’s obligations specified in this Section 6.1 are conditioned on Broker notifying Vela promptly in writing of the Claim and giving Vela full authority, information and assistance in the defense of such Claim, settlement negotiations and any settlement thereof. The obligations of defense set forth in this Section 6.1 shall be at Vela’s expense. Vela shall not be liable for costs incurred by Broker in monitoring the defense of any Claim hereunder or any other costs incurred by Broker that are not agreed to in advance by Vela. Vela shall not be obligated to indemnify Broker for any settlement entered into by Broker without Vela’s written consent thereto. 6.2. Mitigation of Damages. If a Claim has occurred, or in Vela’s reasonable opinion may occur, Vela, at its sole option and expense, may (1) procure for Broker and its Client the right to continue using the Platform as provided by Vela, (2) replace or modify the Platform so that it becomes non-infringing or, (3) if neither of the foregoing alternatives is reasonably available, immediately terminate Vela’s obligations (and Broker’s and its Client’s rights) under this Agreement with respect to such Platform. Vela shall not be liable for any claim based on Broker’s use of the Platform after Vela has informed Broker of modifications or changes in such Platform and offered to implement those modifications or changes at no additional charge, including with respect to any updates or patches provided to Broker. 6.3. Exclusions. Notwithstanding the foregoing, Vela shall have no liability for any Claim arising out of or based upon (1) the combination, operation or use of Platform with equipment, devices or software not supplied by Vela, (2) the alteration or modification of any Platform unless such alteration or modification is made pursuant to Vela’s express written instructions, (3) the use of the Platform other than in the specified operating environment, (4) any Third Party Software, (5) any portion of the software that is licensed under any open source software license, including the General Public License or any other license agreement or arrangement obliging a licensee to make source code or object code available to third parties, (6) Vela’s compliance with Broker’s designs, specifications or written instructions or (7) the use of the Platform other than in accordance with the terms of this Agreement. Notwithstanding anything to the contrary in this clause, Vela’s liability shall not be excluded in case of Vela’s negligence, fraud or willful default. 6.4. THE FOREGOING, SUBJECT TO SECTION 7, STATES THE ENTIRE OBLIGATION OF VELA, VELA’S AFFILIATES AND VELA SUPPLIERS, AND THE EXCLUSIVE REMEDY OF BROKER, WITH RESPECT TO INFRINGEMENT OF PROPRIETARY RIGHTS IN CONNECTION WITH THE DELIVERABLES PROVIDED HEREUNDER. 6.5. Indemnity by Broker to Vela. Subject to clauses 6.1 and 6.2, Broker shall defend and hold Vela harmless for any acts or omissions by Broker, or any of its Affiliates, employees, agents or representatives, resulting in any claim made against Vela with respect to infringement (except for Broker’s authorized use of any Platform pursuant to this Agreement and a mutually executed Schedule) or any other matter, including reasonable attorney’s fees, and any other costs and expenses reasonably incurred by Vela in such matter, except in case of Vela’s negligence, fraud or willful default. NEITHER PARTY SHALL BE LIABLE TO THE OTHER PARTY OR ANY OTHER ENTITY OR PERSON FOR ANY INDIRECT, SPECIAL, INCIDENTAL, EXEMPLARY, PUNITIVE OR CONSEQUENTIAL DAMAGES, INCLUDING, WITHOUT LIMITATION, LOSS OF DATA, TRADING LOSSES, LOSS OF PROFITS, LOST TIME OR GOODWILL, EVEN IF IT HAS BEEN ADVISED OF THE POSSIBILITY OF SUCH DAMAGES, WHETHER IN CONTRACT, TORT, STRICT LIABILITY OR OTHERWISE. IN NO EVENT SHALL THE MAXIMUM CUMULATIVE LIABILITY OF EITHER PARTY FOR ANY AND ALL CLAIMS ARISING UNDER OR RELATED TO A SCHEDULE, REGARDLESS OF THE FORM OF ACTION, EXCEED, IN THE AGGREGATE, THE TOTAL AMOUNT ACTUALLY PAID BY BROKER’S CLIENT TO VELA PURSUANT TO THE APPLICABLE SCHEDULE FOR SUCH DELIVERABLE DURING THE PRECEDING 12-MONTH PERIOD. THE FOREGOING LIMITATION OF LIABILITY SHALL NOT APPLY TO (1) THE FAILURE OF CLIENT TO MAKE PAYMENTS, (2) LIABILITY RESULTING FROM THE GROSS NEGLIGENCE, FRAUD OR WILLFUL MISCONDUCT OF A PARTY, (3) CLAIMS AGAINST THE CLIENT FOR INFRINGEMENT BASED ON CLIENT’S AUTHORIZED USE OF THE DELIVERABLES, (4) CLAIMS AGAINST VELA FOR INFRINGEMENT OR ANY OTHER CLAIM BASED ON CLIENT’S OR BROKER’S UNAUTHORIZED USE OF ANY DELIVERABLE, OR (5) USE OF THE DELIVERABLES OUTSIDE THE SCOPE OF THE LICENSE GRANTED PURSUANT TO THIS AGREEMENT. THE PARTIES ACKNOWLEDGE AND AGREE THAT THE AMOUNTS PAYABLE UNDER THIS AGREEMENT ARE BASED IN PART ON THE LIMITATIONS OF LIABILITY SET FORTH IN THIS SECTION 7 AND THAT SUCH LIMITATIONS SHALL APPLY NOTWITHSTANDING ANY FAILURE OF ANY ESSENTIAL PURPOSE OF ANY LIMITED REMEDY. 8.1. Broker’s Risk. 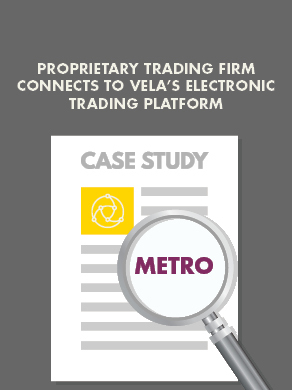 Broker acknowledges and agrees that Vela’s provision of each Platform to Broker under this Agreement does not constitute the provision of investment, financial, tax or legal advice. Vela does not offer and Vela shall not be deemed to have provided any advice regarding the nature, potential value or suitability of any particular security, transaction, investment or investment tactic or strategy. Broker further understands and acknowledges that its use of the Platform and any decisions made in reliance on such Platform are made at Broker’s own risk. 8.2. Assignment. Neither party may assign this Agreement or any of its rights or interests hereunder, nor may any party delegate any obligation to be performed hereunder, without the prior written consent of the other party; provided, however, that either party may, upon notice to the other, assign this Agreement or any of its rights or interests hereunder, or delegate any of its obligations hereunder to (1) an Affiliate, (2) a successor pursuant to a merger, reorganization, consolidation or sale or (3) an entity that acquires all or substantially all of the assignor’s assets; provided, however, that any assignment under this Section shall not expand the scope of the license granted herein. This Agreement shall be binding upon, and shall inure to the benefit of, the legal successors and permitted assigns of the parties. 8.3. Publicity. Neither party shall use the other party’s proprietary indicia, trademarks, service marks, trade names, logos, symbols or brand names, or otherwise refer to or identify the other party in advertising or publicity releases to third parties, without, in each case, the prior written consent of the other party. Notwithstanding the foregoing, Broker acknowledges and agrees that Vela or a Vela Affiliate may disclose the identity of Broker as a user of Vela’s products and services in its marketing materials and on its website. 8.4. No Solicitation. Broker shall not directly or indirectly solicit any Vela employee for employment or services during the term of this Agreement, nor during the 12-month period following the expiration or termination of such Schedule. For the purposes of this Section 8.4, the advertisement of employment opportunities by a party in any public forum (including, without limitation, magazines, trade journals, publicly accessible internet sites, classified advertisements or job fairs open to the public) shall not be considered “solicitation,” and the hiring of an individual as a result of his or her response to such a general employment advertisement or in response to his or her unsolicited employment inquiry shall not constitute a breach of this Agreement. 8.5. Notices. Any notice, demand or other communication under this Agreement may be provided electronically or may be sent by regular mail or overnight delivery, addressed to the Parties at their respective addresses. 8.6. Compliance with Law. Notwithstanding any other provision in this Agreement, Broker acknowledges and agrees that the Confidential Information, Platform and any other items or services provided by Vela to Broker may not be disclosed or distributed to any person or entity targeted by any of the economic sanctions of the United States administered by the United States Treasury Department’s Office of Foreign Assets Control (“OFAC”), any person in any country targeted by such OFAC sanctions or used, in whole or in part, in any way that reasonably could be expected to cause a violation by Vela or any Affiliate of such OFAC sanctions or restrictions on the export, re-export, sale or transfer of goods and technology administered by the United States Department of State or United States Department of Commerce. 8.7. Independent Contractor. Vela, in the provision of Platform hereunder, is acting as an independent contractor. Personnel supplied by Vela in connection with this Agreement are not Broker’s employees or agents. 8.8. Choice of Law and Jurisdiction. The substantive laws of the State of New York shall govern this Agreement as though this Agreement was entered into, and was to be entirely performed within, the State of New York. All claims or disputes arising out of or in connection with this Agreement shall be heard exclusively by any of the federal or state courts of competent jurisdiction located in New York, New York, U.S.A. To the fullest extent permitted by law, each party hereby expressly waives (on behalf of itself and on behalf of any person or entity claiming through such party) any right to a trial by jury in any action, suit, proceeding or counterclaim of any kind arising out of or in any manner connected with this Agreement or the subject matter hereof. 8.9. Force Majeure. A party shall be excused from a delay in performing or a failure to perform its obligations under this Agreement (except for payment obligations, for which this Section 8.9 shall not apply) to the extent such delay or failure is caused by the occurrence of any contingency beyond the reasonable control, and without any fault, of such party. In such event, the performance times shall be extended for a period of time equivalent to the time lost because of the excusable delay; provided, however, if the delay or failure continues for more than 30 days, the party not relying on the excusable delay may terminate any affected Schedule in whole or in part, upon notice to the other party. 8.10. Construction, Interpretation, Amendments and Waivers. This Agreement constitutes the complete understanding of the parties, and supersedes all prior or contemporaneous agreements, discussions, negotiations, promises, proposals, representations and understandings (whether written or oral) between the parties, with regard to the subject matter hereof. Each party acknowledges and agrees that any interpretation of this Agreement shall not be construed against a party by virtue of its having drafted the provisions hereunder. The terms, conditions, covenants and other provisions of this Agreement may be modified, amended, supplemented or otherwise changed only by a written instrument (excluding e-mail or similar electronic transmissions) that specifically purports to do so and is physically executed by a duly authorized representative of each party. If a court of competent jurisdiction declares any provision of this Agreement to be invalid, unlawful or unenforceable as drafted, the parties intend that such provision be amended and construed in a manner designed to effectuate the purposes of the provision to the fullest extent permitted by law. If such provision cannot be so amended and construed, it shall be severed, and the remaining provisions shall remain unimpaired and in full force and effect to the fullest extent permitted by law unless the essential purpose of this Agreement would be affected, in which case this Agreement shall terminate. This Agreement may be executed in counterparts, each of which shall be deemed to be an original. No provision of this Agreement shall be deemed to have been waived by any act or knowledge of either party, but only by a written instrument signed by a duly authorized representative of the party to be bound thereby. Waiver by either party of any default shall not constitute a waiver of any other or subsequent default. 8.11. Conflict. In the event of any inconsistency between the provisions of this Agreement and any Schedule, the express provisions of the Schedule shall govern for purposes of such Schedule only. 8.12. Survival. The provisions of this Agreement that, by their nature and content, must survive the completion, rescission, termination or expiration of this Agreement in order to achieve the fundamental purposes of this Agreement shall so survive and continue to bind the parties.